Amsterdam, March 20, 2018 – World meat consumption has increased during the last decades, and evidence is mounting that high consumption of red and mainly processed meat is unhealthy to humans and is related to chronic diseases such as cancer, type 2 diabetes, and cardiovascular disease. A new study published in the Journal of Hepatology adds non-alcoholic fatty liver disease (NAFLD) to the list. "NAFLD is considered as the hepatic component of the metabolic syndrome, with insulin resistance and inflammation as key factors in its pathophysiology," explained lead investigator Prof. Shira Zelber-Sagi, RD, PhD, from the School of Public Health, Faculty of Social Welfare and Health Sciences, University of Haifa, Israel. "Unhealthy Western lifestyle plays a major role in the development and progression of NAFLD, namely, lack of physical activity and high consumption of fructose and saturated fat. Our study looked at other common foods in the Western diet, namely red and processed meats, to determine whether they increase the risk for NAFLD." In order to test the association of type of meat and cooking method with NAFLD and insulin resistance, investigators undertook a cross-sectional study among individuals 40-70 years old who underwent screening colonoscopy at the Department of Gastroenterology and Hepatology in the Tel Aviv Medical Center, and who agreed to participate in a metabolic and hepatic screening study between 2013 and 2015. 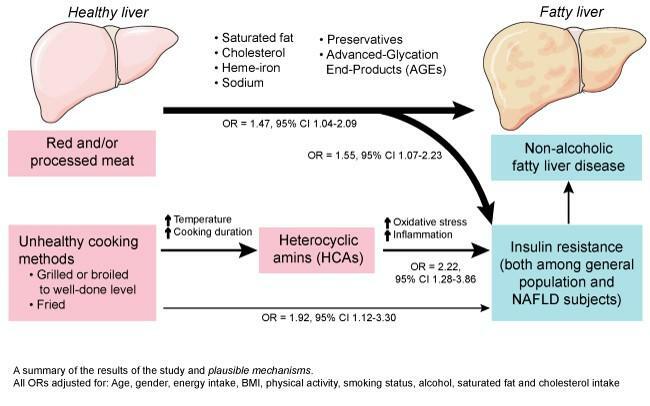 NAFLD and insulin resistance were evaluated by ultrasonography and homeostasis model assessment (HOMA). Meat type and cooking method were measured by food frequency and detailed meat consumption questionnaires. Unhealthy cooking methods were characterized as frying or grilling to a level of well done or very well done. These methods produce heterocyclic amines (HCAs), which are pro-inflammatory compounds, and their intake was also calculated. After excluding some of the participants due to factors such as viral liver disease and alcohol abuse, close to 800 subjects were included in the main analysis, of whom a sub-sample of 357 subjects completed the meat questionnaire. NAFLD was diagnosed in 38.7 percent of participants and insulin resistance in 30.5 percent. The proportion of red and white meat intake was about one third and two thirds, respectively, which is similar to the typical diet of the Israeli population. High meat eaters were slightly younger, mainly male, had a higher body mass index (BMI), caloric intake, and a worse metabolic profile. The results showed that high consumption of red and processed meat is independently associated with NAFLD and insulin resistance regardless of saturated fat and cholesterol intake and other risk factors such as BMI. In addition, individuals who consumed large quantities of meat cooked using unhealthy methods and those already diagnosed with NAFLD who consumed high HCAs had a higher chance of having insulin resistance. Low carb diets are frequently recommended to prevent metabolic diseases. These low carb diets can be very rich in animal protein, especially meat. While meat contributes valuable nutrients that are beneficial to health, including protein, iron, zinc, and vitamin B12, the current study indicates that meat should be eaten in moderation and the type of meat and its preparation method should be wisely chosen. Although the association between high red and processed meat consumption and NAFLD remains to be confirmed by prospective studies, Prof. Zelber-Sagi, recommends limiting red and processed meat consumption in preference for healthier "white meat," such as chicken or turkey, including fish in the diet, and steaming or boiling food instead of grilling or frying meat at a high temperature until it is very well done. "NAFLD is primarily a lifestyle-oriented disease. With sound medical and nutritional guidance from their clinicians, patients are better informed and equipped to implement the lifestyle changes needed to help reverse this disease," remarked Prof. Zelber-Sagi.